Renaissance Indian Wells Resort, 4440 Indian Wells Lane, Indian Wells, CA. Price includes lunch and a copy of "Tangled Vines." On October 12, 2005, a massive fire broke out in the Wines Central wine warehouse in Vallejo, California. Within hours, the flames had destroyed 4.5 million bottles of California's finest wine worth more than $250 million, making it the largest destruction of wine in history. The fire had been deliberately set by a passionate oenophile named Mark Anderson, a skilled con man and thief with storage space at the warehouse who needed to cover his tracks. With a propane torch and a bucket of gasoline-soaked rags, Anderson annihilated entire California vineyard libraries as well as bottles of some of the most sought-after wines in the world. Among the priceless bottles destroyed were 175 bottles of Port and Angelica from one of the oldest vineyards in California made by Frances Dinkelspiel's great-great grandfather, Isaias Hellman, in 1875. Frances Dinkelspiel is an award-winning author and journalist. 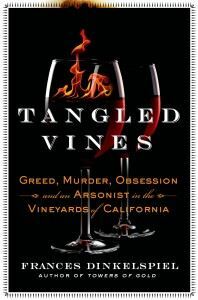 Her most recent book, Tangled Vines, was a New York Times and San Francisco Chronicle bestseller and was named a best wine book of 2015 by the Wall Street Journal, Food and Wine magazine, and the San Jose Mercury News. Her first book, Towers of Gold: How One Jewish Immigrant Named Isaias Hellman Created California, was also a San Francisco Chronicle bestseller. A graduate of Stanford University and the Columbia University Graduate School of Journalism, Frances started her reporting career at the Syracuse Newspapers in upstate New York and later moved to the San Jose Mercury News. Frances’s freelance articles have appeared in the New York Times, the Wall Street Journal, the Los Angeles Times, Daily Beast, People Magazine, the San Francisco Chronicle, San Francisco Magazine and elsewhere. Conversation with the author and book signing. Click here for online registration and payment options.